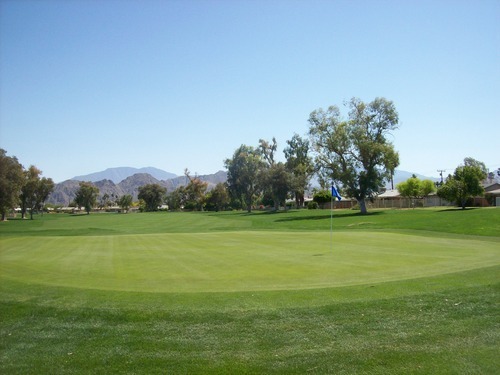 After 36 relatively quick holes in the morning at Cimarron, I decided I wasn’t quite done for the day. 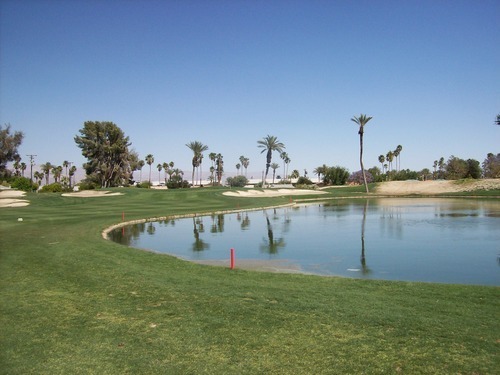 This seems like a nice time to play out in the desert because the prices are starting to go down a bit, but the conditions are still great at most courses. I wanted to take advantage as much as I could while out there for the day. 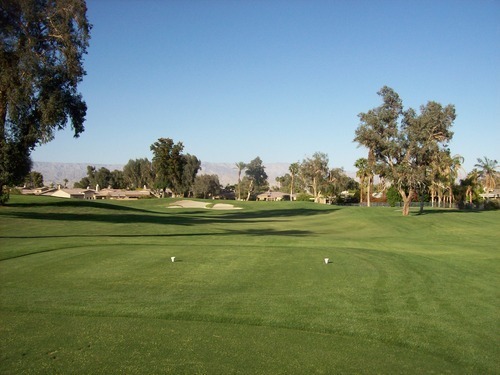 I scanned GolfNow on my phone for some good tee times and found a number of good options, but ultimately settled on Palm Desert Country Club for $39. 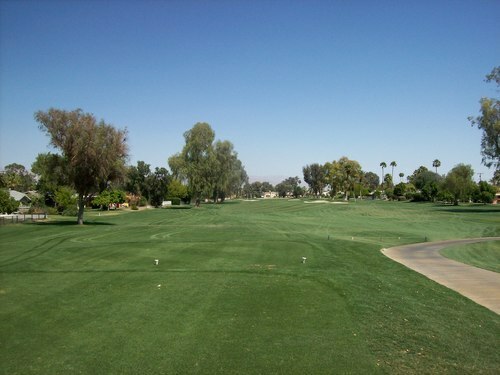 I made my way over to the course and figured it would be pretty slow out there on a very warm Saturday afternoon in the high 90s. There wasn’t much going around the clubhouse, so I figured things would work out well. After checking in, they let me head directly out to the first tee by myself. It was a few holes before I ran into another twosome, who let me play through. 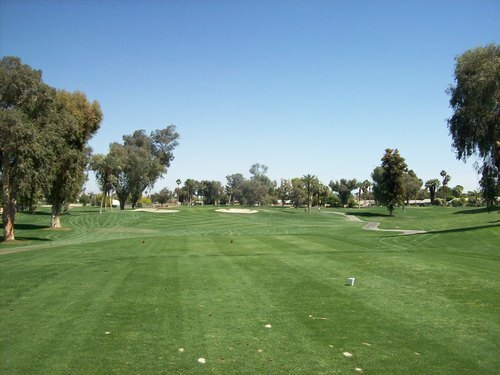 I flied through the front nine and the first couple holes of the back before hitting more groups. Once I realized I wouldn’t be playing through, I had no choice but to relax and find shady spots to wait in between shots. Still, the overall pace was reasonable at about 3.5 hours for the whole round. 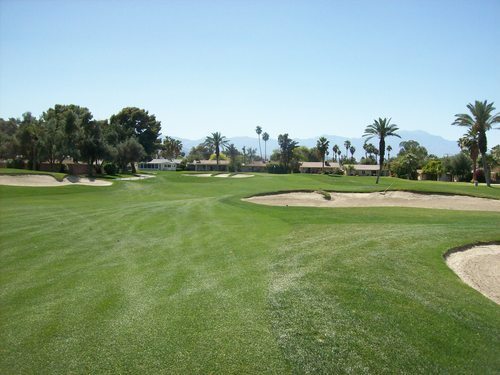 I really didn’t know much about Palm Desert Country Club going in. 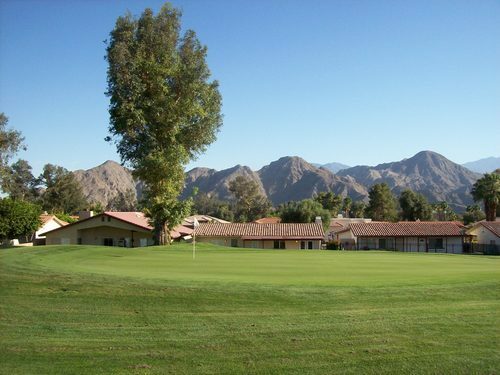 I knew it wasn’t anything too spectacular and fit the mold as a pretty traditional country club/residential Coachella Valley layout. However, I’ve been hearing some good things about it lately. 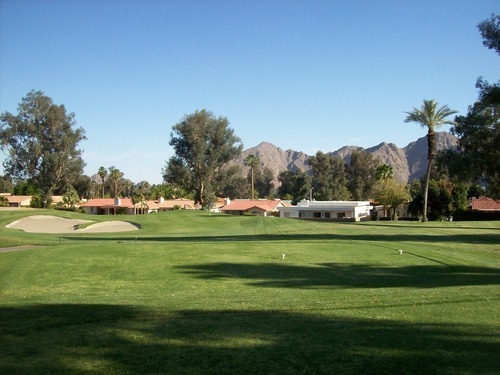 Apparently, they recently completed some major renovations to the course. I don’t know all the details, but I believe it included reshaping most of the bunkers and adding some more distinctive contours to the fairways and greens. Having not played here before, I can’t make any direct comparisons, but by most accounts it seems the work paid off. 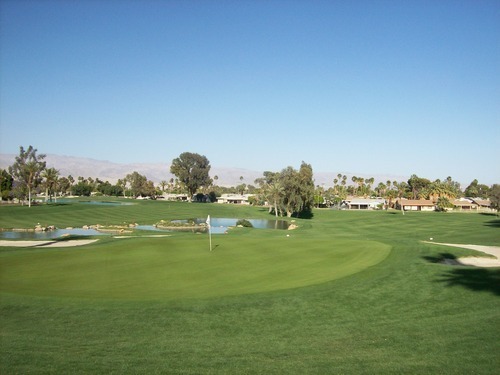 Still, Palm Desert Country Club is your standard desert fare. Not that it’s a bad thing, but it won’t blow you away visually like some of the more dramatic resort layouts. 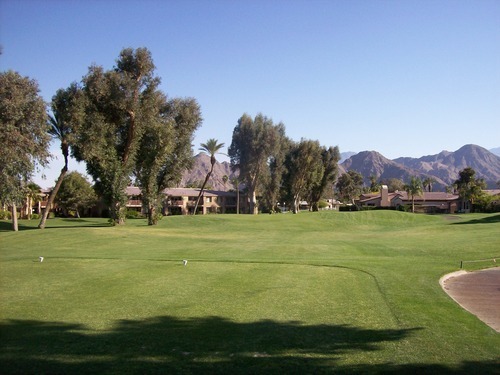 The course winds its way through a residential area and houses line every fairway. There is still plenty of room for error, so only the strayest of stray drives will bring house/OB into play on most holes. 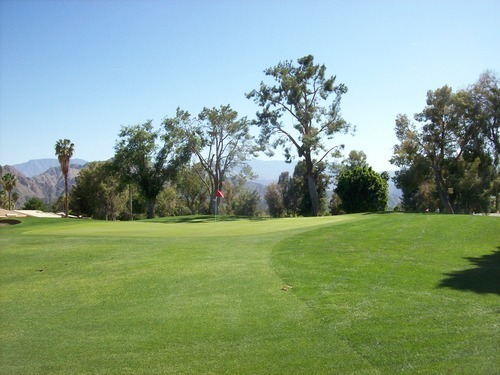 Plus, there are plenty of trees on the outer edges of the fairways to knock your ball down if needed. 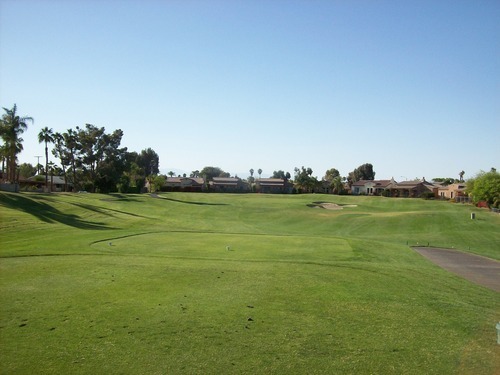 Most holes have some sort of dogleg, but nothing too crazy. From the tee, it’s pretty easy to figure out what each hole does and where the best positions probably are. Water comes into play on a handful of holes (more on the front than on the back). With the renovation, it appears they switched the nines here. 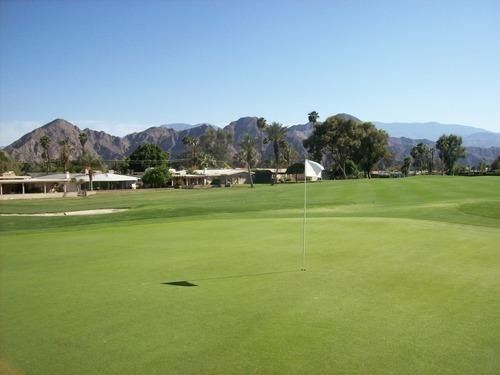 Normally, I don’t care for this practice, but I think it was a good choice at Palm Desert CC. Of course, I am unbiased having never played here before. 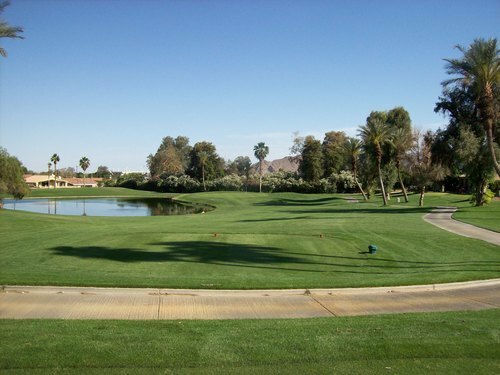 As it plays now, the course finishes with some of its strongest holes (16 and 18 are very nice holes). The front nine finishes pretty strongly with the 9th (formerly a very formidable 18th) being one of the tougher and more memorable holes with water in play on both your shots. The hole that stood out to me most, though, was the 12th. It caught me a little by surprise. Most of the course is very flat without any changes in elevation. 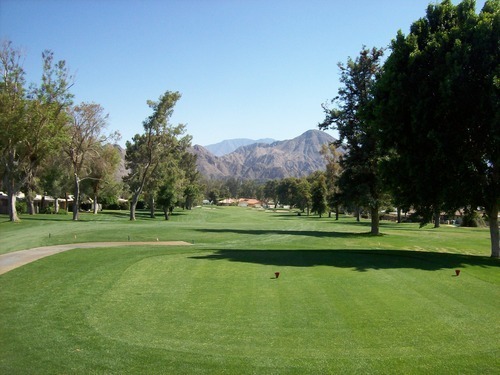 The 12th features an elevated tee overlooking one of the narrower fairways on the course and then the stunning mountains framing the hole from behind. It’s not really that much of an elevation change as you’ll see in the picture, but it was an unexpected surprise and definitely my type of hole. 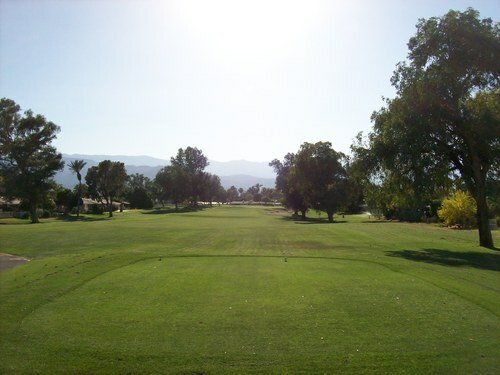 After that, there are some slight hills as you finish out the back nine, but nothing as dramatic. 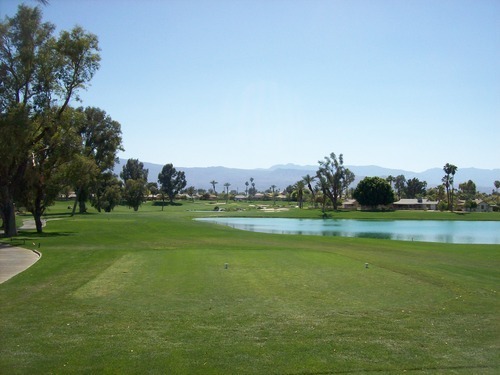 The conditions were really nice at Palm Desert Country Club. Everything was green and lush from tee to green. 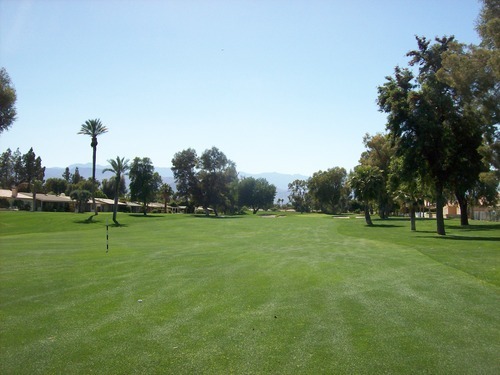 The fairways were excellent to hit from with nice soft grass. The rough was punishing. It wasn’t super deep, but it was very thick and the ball always sunk down into it, making it very tough to hit from. The bunkers had nice sand, as well. 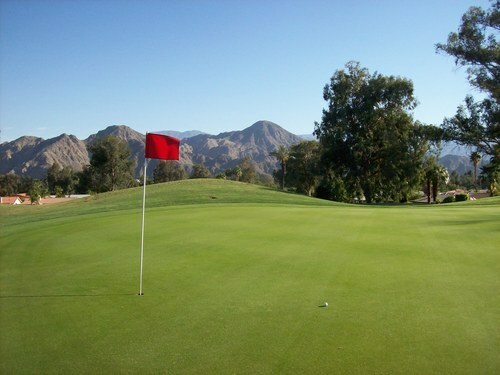 The greens were nice, but they were giving me fits all day. They were very smooth and rolling true at medium/slow speeds. There were a few thin spots here and there, but nothing bad. They were, however, a bit too firm for my liking. 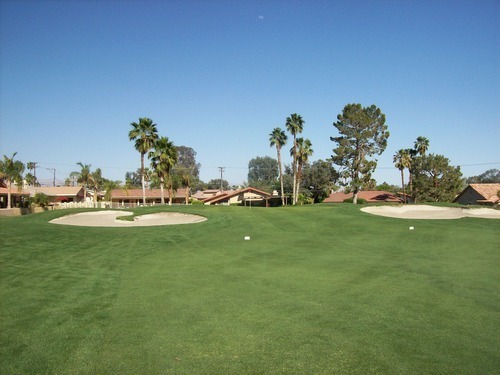 When it came to chips and pitch shots, I tried just about everything but had a hard time getting the ball to stop. Soft/high shots would take big bounces. Bump and run shots would run out and usually end up way past the hole. Low shots that would normally check up for me would not bite at all. I don’t think the greens were bad at all, but I could not figure them out. 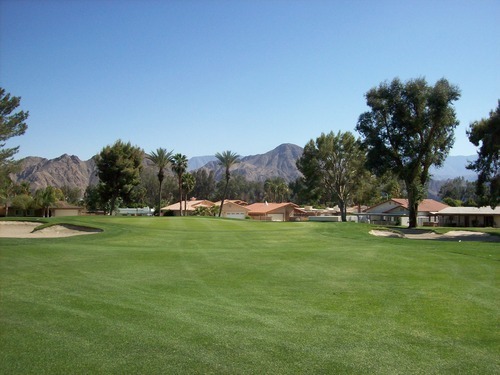 For the price, I was happy with my visit at Palm Desert Country Club. 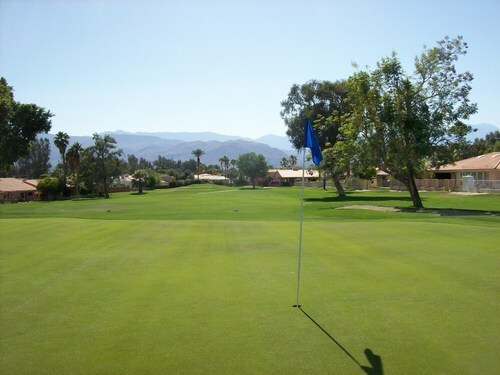 It’s a solid course that’s currently in excellent condition. Though the staff was sparse in the afternoon, they were all very nice and accommodating. 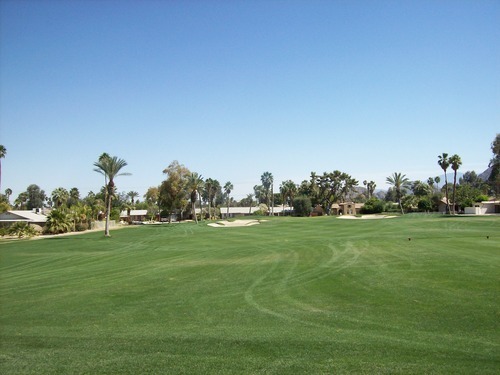 It’s a good local course to play while you are in town, but it’s not one you’d travel great distances to play. Note: The Executive course is now closed. I headed out to the Executive course at about 5:00. As I was getting myself ready on the first tee I noticed there was no flag on the green. “Oh well, this is just for fun” I thought to myself. But within a couple minutes, a guy came out with all the flags on his cart. I guess they had already pulled them for the evening, but he went ahead and put them all back out for me. I thought this was a great bit of service since I was the only one playing the course. On my own, I zipped through the small course in about a half hour. I didn’t mess around much after such a long day of golf under the unrelenting desert sun. Like its big brother, the Executive course was in equally great shape. 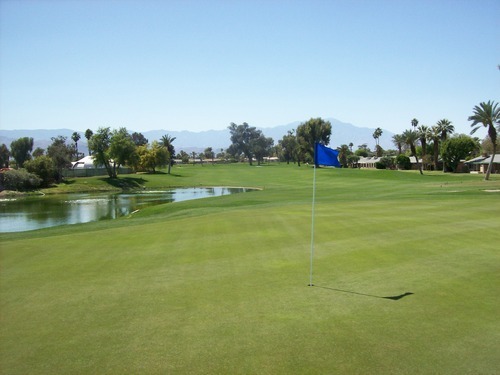 The greens were really nice and actually much more receptive than the big course. Otherwise, everything was lush and pretty green throughout. The tee boxes were great with very minimal damage (clearly not much play today for whatever reason). I was very impressed with the conditioning on this fun little course. 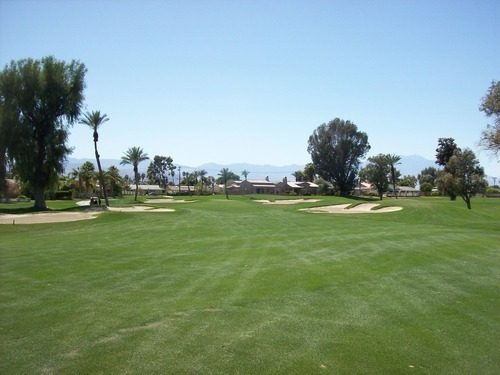 Most of the holes are short without much trouble to get into other than the thick rough. There’s one pretty short and straightforward par-4 and only one of the par-3s is over 150, but it’s a decent mix of lengths otherwise. There isn’t too much to note design-wise, but there’s a nice scenic stretch of holes in the middle with the mountains in the background. 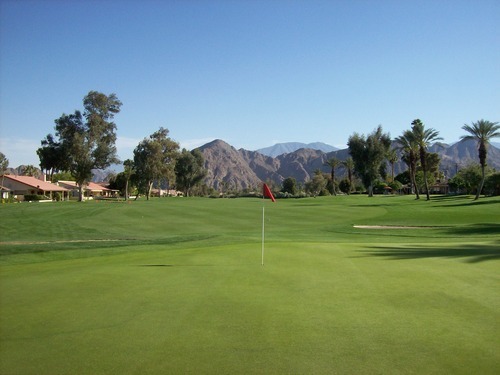 If you have an hour to kill and want to work on your short game, I’d recommend Palm Desert’s Executive course in a heartbeat. It’s pretty basic, but it works well for what it is and the conditioning is fantastic. 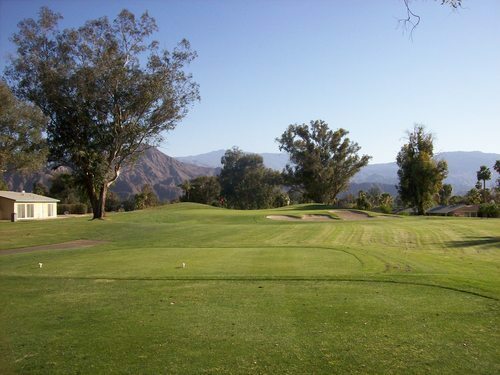 This is the kind of course I’d go out and play all the time after work if it was close to my house. Perfect for a quick evening round by yourself or with a few buddies. What a long day with 63 holes played! 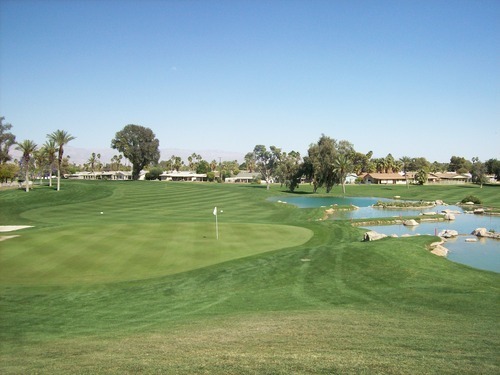 Granted, 33 of those were par-3s and many were quite short on the two executive courses, but it’s still a lot of golf. By the numbers, I played 11 hours of golf Saturday with a couple short breaks in there for lunch and driving between courses. 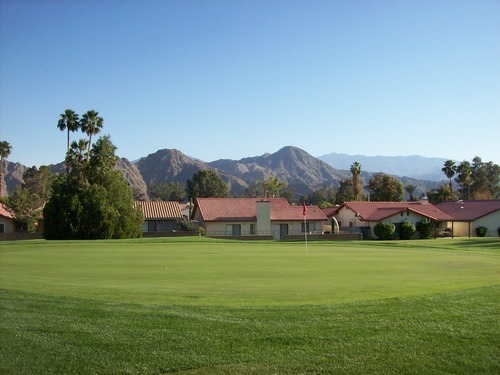 I paid $68.50 for all the golf I played that day, which is easily my best “bargain” day’s worth of golf ever—especially considering the excellent conditions and enjoyable layouts I experienced. 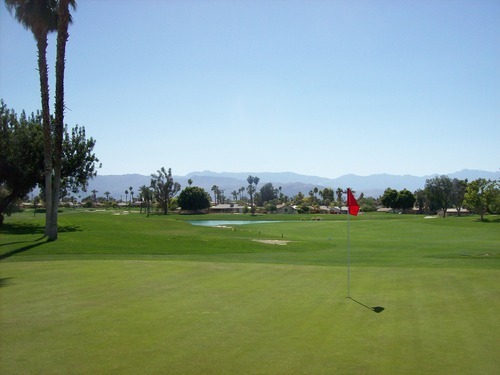 I got to add four new courses to my total list and cross two more regulation 18 courses off of my main SoCal “to-do” list. What a day in the desert!